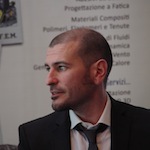 Mechanical Engineer, from 2005 to 2013 he worked at the Department of Industrial Engineering of the University of Parma, in the machinery area. Since 2013 he is a freelance and external collaborator of SIIIA. He is expert in mechanical design and development of machinery and processes for the food industry by means of CAE (Computer Aided Engineering) and Computational Fluid Dynamics (CFD).